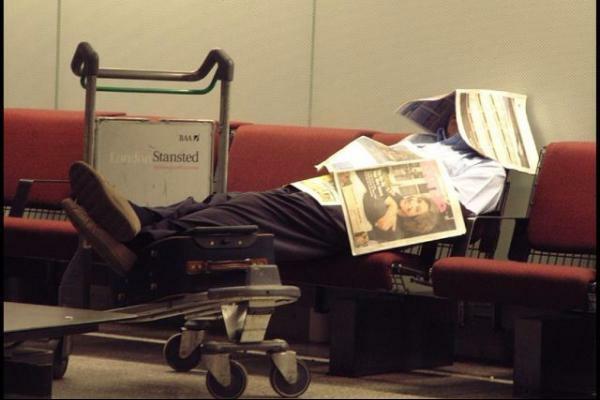 If you want to be at the best places to people watch, then go to an airport. At any airport, interesting folk from all walks of life are going in and out and there are some comical scenes that ensue. 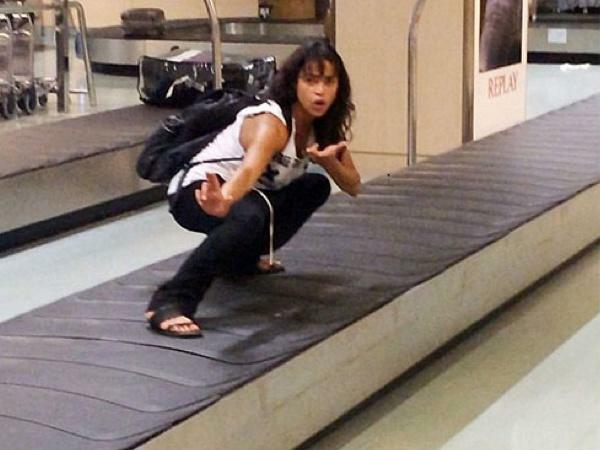 These pictures show some hilarious scenes taken at airports worldwide. You will definitely be entertained. This lady tried to check herself on a plane at an airport in Germany. She was thinking outside of the box here, or shall we say inside the box. Wonder if she saved money on the seat booking. She must be very flexible. Security must have got a shock when they saw a see-through bag with a little blonde lady inside going through the machine. How long did she stay like this do you reckon? Excuse me miss, what is in your boots? She doesn’t look too impressed. Sadly, Heather, you have to go through security just like the rest of us. We bet she is thinking “Don’t you know who I am?”. Perhaps people had been bothering her for her autograph which is why her shades are on, but it makes her stand out even more if anything, do you think she took them off to go through the metal detector? You know what isn’t Fergalicious? Feeling your lovely lady lumps when you’re late for a flight. Fergy Fergy we love you long time and we know you are always dressed to impress. She was probably getting told off about something or giving style advice to the lovely woman patting her down. Imagine getting to have a minute with Fergie. 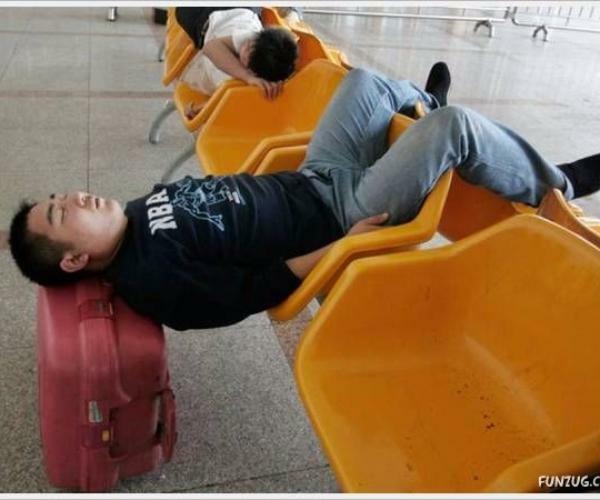 When you are tired, you can literally sleep anywhere, and airports cater perfectly for that. This girl is making great use of the chairs. We think we will try that idea next time. She’s very nimble to get her legs in that narrow space. We hope she doesn’t wake up with a squished face from lying face down in the seat like that. Not sure that this position is entirely comfortable. Now, these are great ideas. 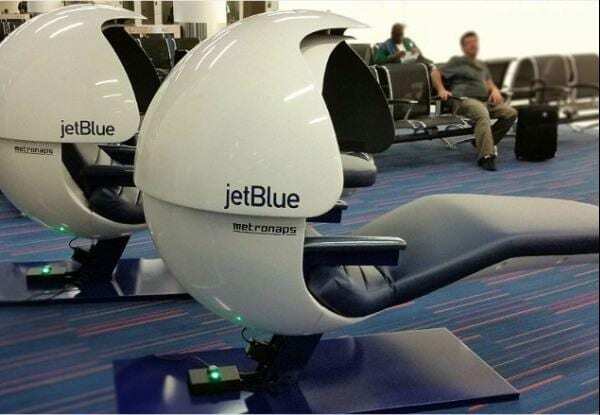 JetBlue is offering its customers the ability to take a nap unaffected by your loud and bright surroundings in these super cool space like sleep pods. But the only issue is that these babies might be so cozy that you end up passing out and missing your flight because you couldn’t wake up. 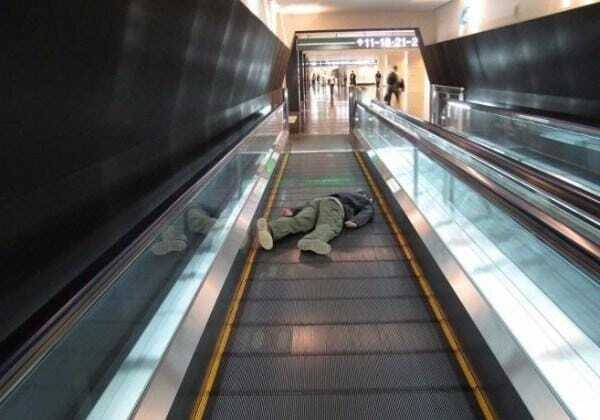 This would be the biggest airport fail. This is a genius hack when your toddler has a hissy fit, it will even prevent them from getting lost. Kids are funny, they just kick up a fuss in the worst situations it’s like they know when the worst possible timing is and they choose then to cause a stir. Does that mean that we need to start having a tantrum? 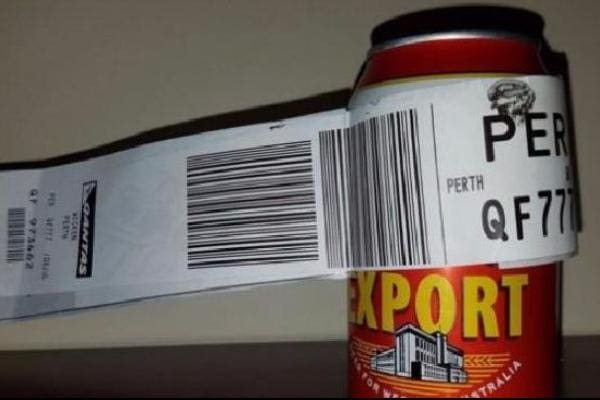 We all have heard the story of a man who checked his 12-ounce beer because airport security wouldn’t let him bring it on the plane. Must be a really good beer. There are definitely those items we just can’t live without and have to take everywhere with us, we were thinking more like our favorite teddy or candy if we go to another country, but this beer really must be something special. 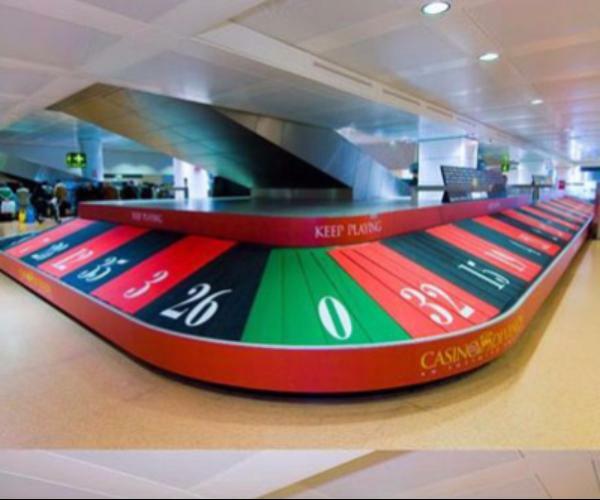 This baggage claim has spiced things up a bit so that when travelers are waiting for their bags they have something fun to look at. This looks like kids are actually swimming in the belt. Will it come, will it not? What if it doesn’t come, how will I brush my teeth tonight? All these thoughts arise, so this fun advert helps to make a stressful time more playful. Moving walkways always take a while to get used to, are you supposed to go slow? or fast? 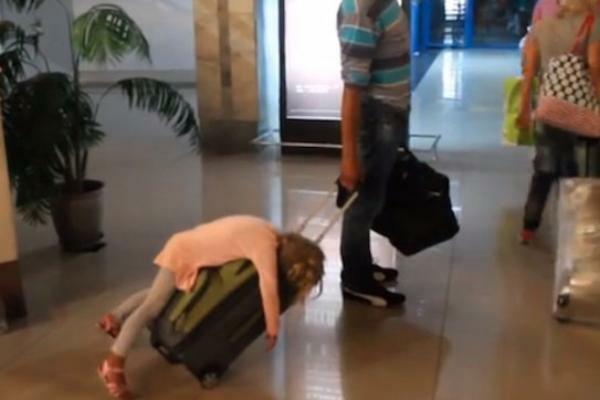 These kids are making up their own rules clearly, but seem to be making the most of their long layover. What will happen next we wonder? Will she jump over her friend? Will they fall? Oh it’s all a big guessing game from here. One thing is for sure, don’t try this at home. 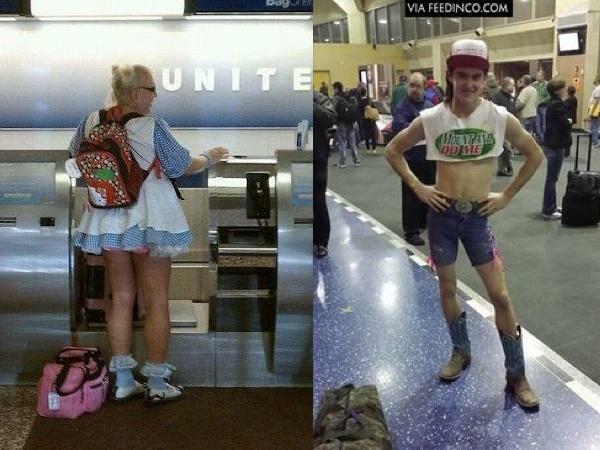 We wonder how many daring outfits airport staff has to endure, especially bachelor and bachelorette trips. This woman has got it all sussed out, with her matching socks and hello kitty backpack, but we are slightly nervous that this outfit may not be for a dress-up event, and that she chose to wear it as her personal style. Whatever floats your boat, hey? If only we were a fly on the wall for all the outfits that must come and go. 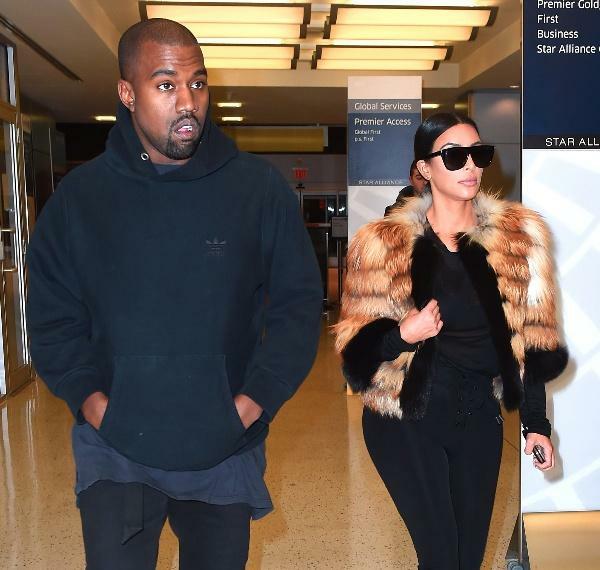 Even superstars like Kim Kardashian has to go through airport security. We wonder if her booty ever bleeps. She has nailed her airport style, whether it is stylish shades or long leather boots, this icon always dresses to impress when traveling, as if the airport is her runway. We think it will take a while to take those boots off Kim, maybe they aren’t the most practical shoes to travel in. Then she has to put them back on again… What a faff! 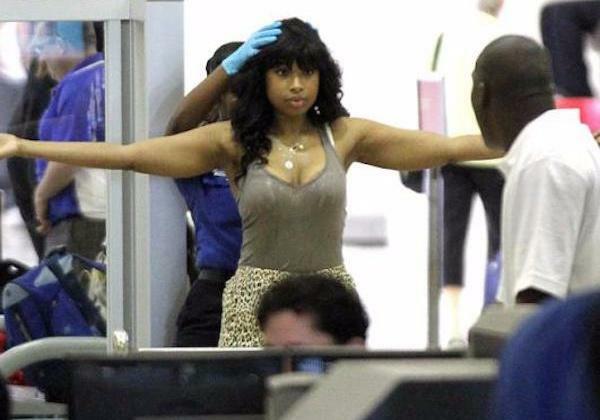 These TSA agents were not letting any blonde bombshells through security with a proper search. So much so that she has to stand on her tiptoes when getting scanned through security. 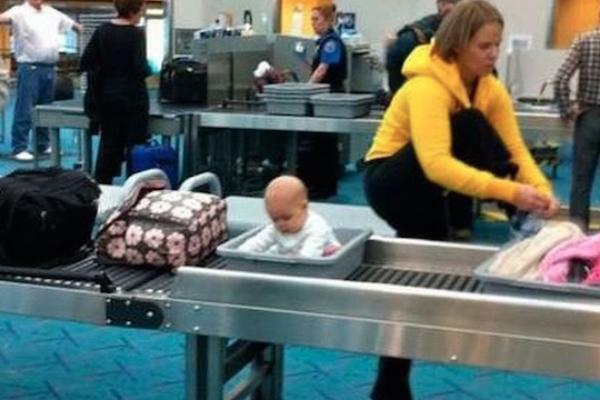 The TSA doesn’t let anyone in without a thorough check, but surely she can’t be hiding anything up there. This one we aren’t so sure about Kim. Well, one thing is for sure, she has some soft cushioning during the flight from her derriere. 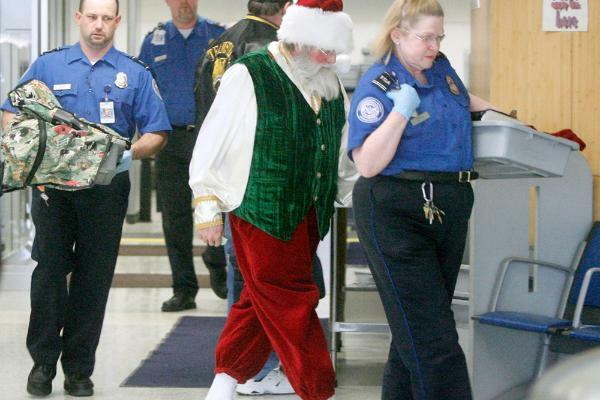 Celebrities are no different than us when it comes to the TSA. 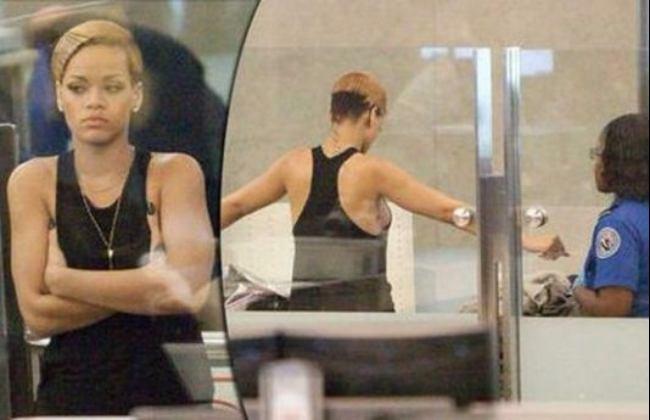 Yet Rihanna does not seem impressed that she has to be checked just like us mere mortals. This TSA agent looks star struck as the singer tries to cover up her bee stings. We think she forgot to put a bra on, she must have been in a hurry for her flight. Well, Rhi Rhi, you can stand under my umbrella anytime. It is always a rollercoaster of feelings when flying, and exhaustion can just take over so quickly. 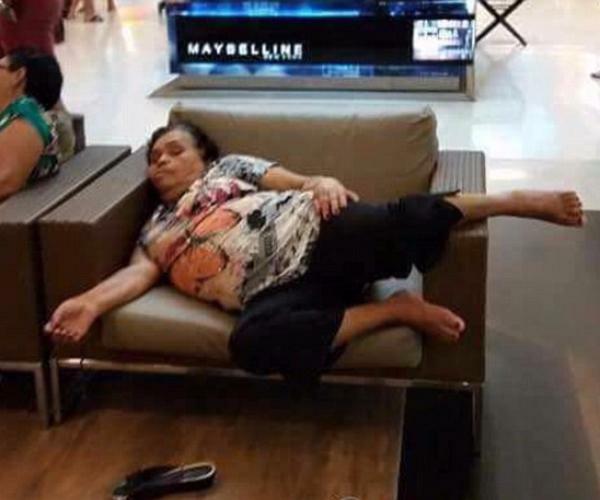 In that moment you have to think on your feet, or on your chair as this lady did. She expertly used her belongings as a pillow. We just don’t know how comfortable that is on her neck, but nevertheless, she hacked the hack out of any airport trick. Talk about friendly love, this guy is just chilling reading his book whilst holding up his pal. Just how long do you think it took after this was taken for him to fall down and for his friend’s arm to get tired? But still, this is very impressive and surely gave other travelers a good show. 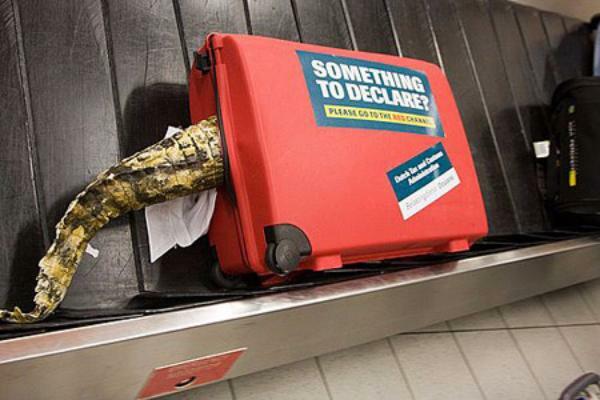 This customs ad reminds passengers to declare everything at the customs window… or else. 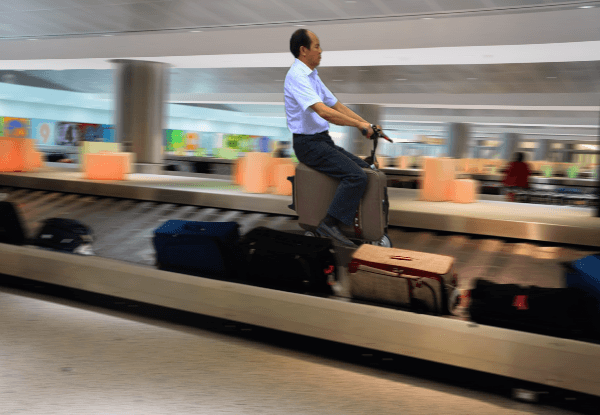 Have you ever watched that hilarious tv program where foreign travelers try to bring in the weirdest things through customs? There are so extremely strange ones, like crickets and dead animals, all sorts, so this sign is quite accurate. We wouldn’t put it past some of these interesting people you meet at airports. Sometimes you just have to take a breather and get some rest, but what about all those bright lights? This family has a hack, especially for this time. We think they probably bought these lovely shawls from a lucky lucky man on the beach. Such a wonderful array of colors and patterns. Next time we will try this trick thank you! This passenger is surfing the baggage carousel. Or even better, or should we say worse, if all of the bags suddenly came out and took them with her, that would be quite a sight. We don’t suggest doing this at home kids, just in case. Johnny Depp always travels in style. From his accessories to his arm pieces. However, his trip to Oz with his now ex-wife Amber Heard, truly was an airport fail when they tried to illegally bring their dogs into the country. It did not go down well and they had to travel right back to where they came from. Don’t mess with Australian authorities is the moral of this story. 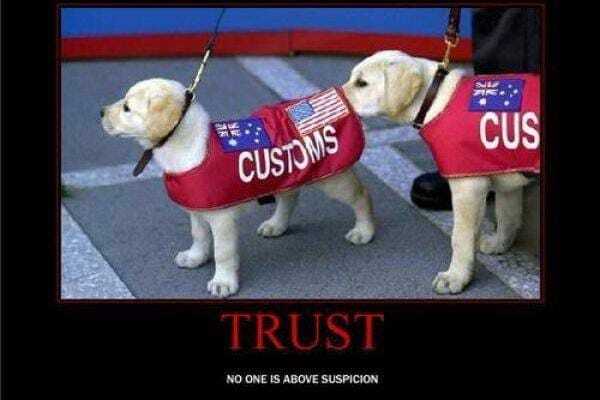 Not even customs dogs trust each other. What’s up there little guy? We would just want to play with this adorable puppies if we saw them in the airport, but they mean business, can’t you see? Do you think they get their game face on when they smell something suspect and turn into cop doggies growling and sniffing away? This tired traveler found a way around those annoying armrests that don’t move and found a comfortable place to sleep. All she needs now is a blanket, an eye patch, a pillow some meditation music and she’s all sorted. IS SHE DEAD OR DEAD TIRED? 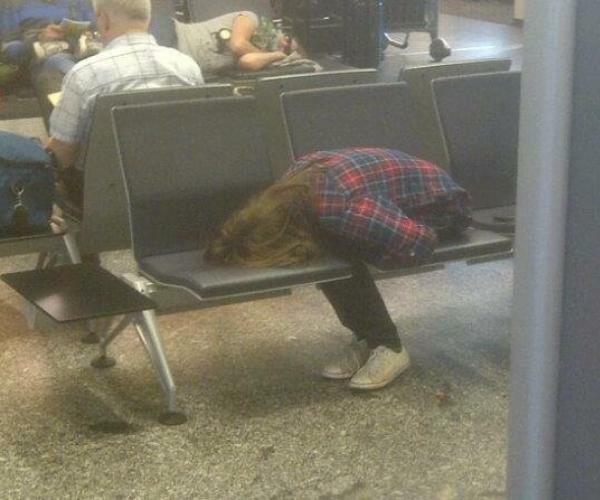 She must have had a terribly long layover or drank a lot on the flight. However, the bathroom floor is not the best place to catch some zzz’s. We think fetal position may be more apt for this occasion darling. At least lie on your bag, duh! We’d hate to think how dirty that floor is! Wonder if the cleaning staff ever woke her up or she is still sleeping there? SANTA, WHAT’S IN YOUR BAG? This hilarious picture is very ironic. Santa has definitely been on the naughty list this year. Whatever could be the reason for this we wonder? It will make us think twice about sitting on Santa’s lap come to Xmas. It’s the most wonderful time of the year, but not for Mr. Claus, Mrs. Claus you must set your husband on the right path. We bet the police loved this one. When you are a famous actor like actor James Van Der Beek, nothing phases you, clearly. He seems to be enjoying himself also. What a down to Earth guy! 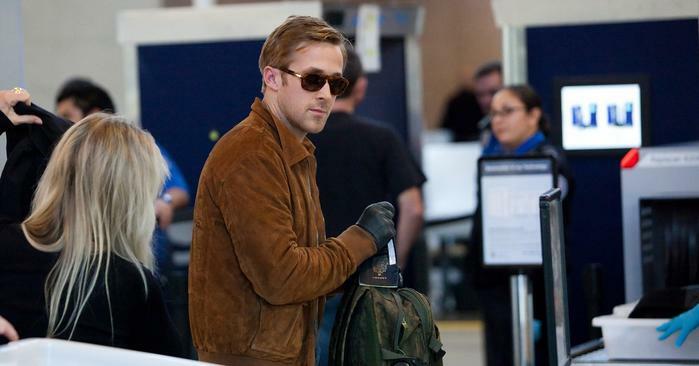 Acclaimed actor Ryan Gosling never lets his style guard down, even when flying. We wonder what the gloves are for Ryan. Nice shades. Do you think he took them off to swoon at the airport staff? 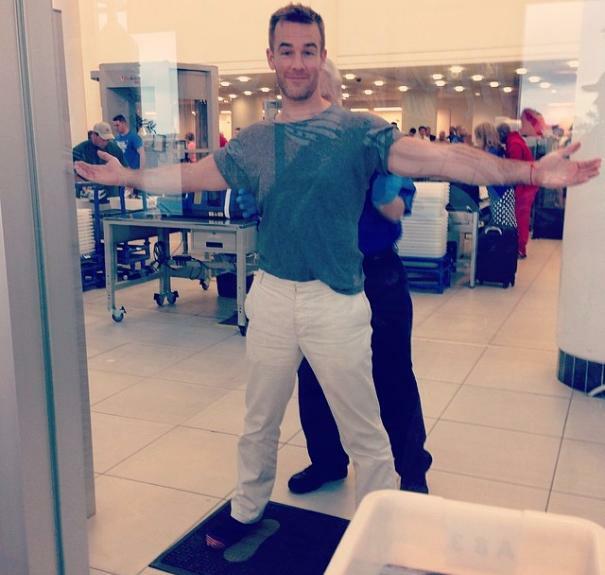 This Hollywood hottie for sure got some glances when he went through security. So suave and chic Ryan. Oh parents, they just don’t know when to stop embarrassing us! This mom was clearly proud and excited to see her son or daughter, but we don’t think she thought the sign through very well! It’s like they are a bit socially inept sometimes, or do they do it on purpose? We hope that whoever received this, could look past the embarrassment and see a loving mother. It’s always a good time to get in some airport aerobics while you are waiting for your flight. To really stretch out those calves and hamstrings and lengthen and strengthen. Get that airport downward dog on. Oh No, Actress Gwyneth Paltrow almost lost her head when she walked in front of a jet engine after her flight. Wonder if Goop has any advice for this mishap. She most definitely has some almond oil in her bag along with an emergency brush, an avocado face mask, and some healthy snacks to calm her down. We have no fear that the health queen will have some tricks up her sleeve or a stylist who travels with her, as she is a celeb. Ohhh this is what roller bags are meant for, silly us! These guys have really utilized their wheels to travel in style. Why didn’t we think of that! This way they don’t have to sit with the bag on their lap. It happily wheels down the freeway without bother. Alas, they surely can’t go very fast en route. Wonder if he will get up in time? It looks fun but we think it’s one of those things that seems more enjoyable than it is. For this trick, you have to jump up like a ninja at the perfect time or you’re gonna get a nasty shock when it reaches the end. Celebrities seem to travel more than anyone. Beyonce and Taylor Swift are showing off their airport style. Ooh, Taylor, look what we made you do. You look as though you are going to church, must be to repent of the sins from your new album, terrorizing your fellow pop stars. Queen Bey, she be all night choosing this demure outfit, however, it is slightly less out there than her usual closet style. Maybe she was going for a conservative boring look. Will anyone even see it? Think this is definitely a fail from us. The airport can be a very stressful place. Especially after being body searched, running to gates, delayed flights. We think this lady needs some onboard entertainment. Such a surge of emotions on travel days, running around from gate to gate, making sure you get there on time before your flight leaves without you, not knowing what to buy in duty-free, it is all very confusing. She needs a stiff drink if you ask us. Could this be why NWA went out of business? They don’t know how to park. If we looked out of the window and saw that the plane we were about to take was crashing into another one, we can’t say that we would be happy. Especially if the captain was about to take us to our destination. This is a big fail for NWA. Some like to say that celebrities are just like us. 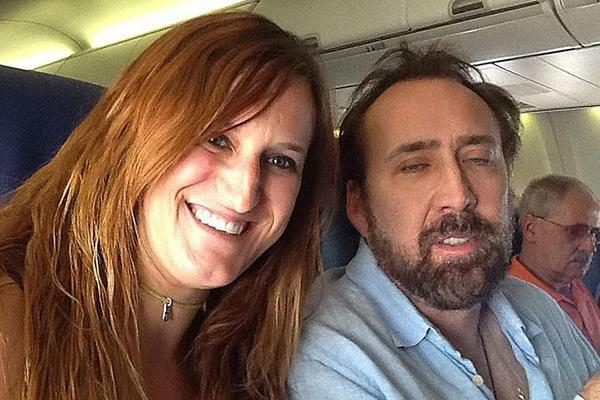 Good old Nick Cage seems to be, flying in the economy just like us paupers, can’t say he seems to happy about the selfie – he was very caught off guard. The fan, however, is loving it! Look at that big old smile on her face – best day of her life. Well, we would also be happy if we were sat next to Nick. 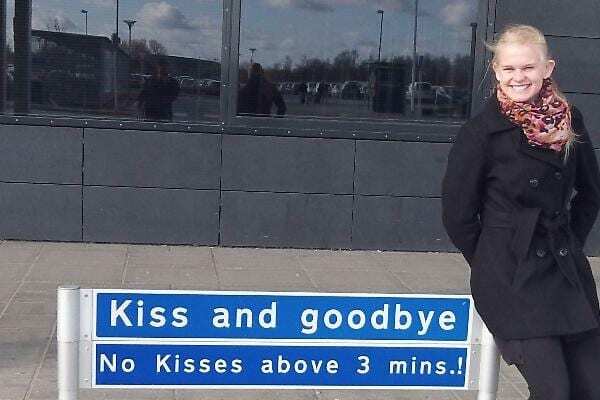 This hilarious sign reminds those love birds out there to keep it short and sweet. There is nothing worse than couples saying their goodbyes and kissing frantically all over each others faces with wet kisses. Come on, you’re just rubbing it in for all those single people out there who have no one to say goodbye to. This person must have been exhausted from their long-haul flight, or maybe they got too drunk. Really spacious and gives you that motion to help you relax. We should all try this hack, at least once. Just in case he forgets what his bag looked like, and so that no-one would steal it, this funny guy got his face plastered all over it. Doesn’t mean we would want to sit next to him though. What if he whips out other personalized items… Who knows what’s in that bag of treats..? Funny, he didn’t pick the happiest picture to use, but he does look very smart in his tie and shirt. There is nothing worse than when you are engrossed in a film during the flight and the person in front of you reclines their seat. Especially when you have long legs. The biggest pet peeve is when you are about to tuck into your meal, and they start to recline and your meal goes everywhere. Tall people have a hard life on planes. This shot was taken in Alaska. 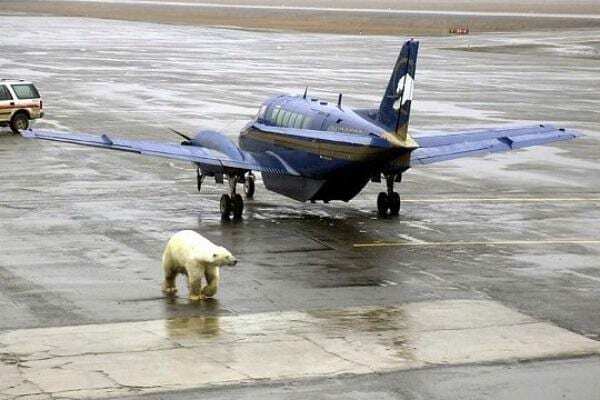 We wonder where the polar bear thinks he’s going. Hey buddy, if you’re looking for some icebergs and fish, you’re in the wrong place. It would be pretty cool to see this on the runway as you are about to board a flight. It is the home of the brave and the land of the free after all this little guy is free to roam wherever he wants. 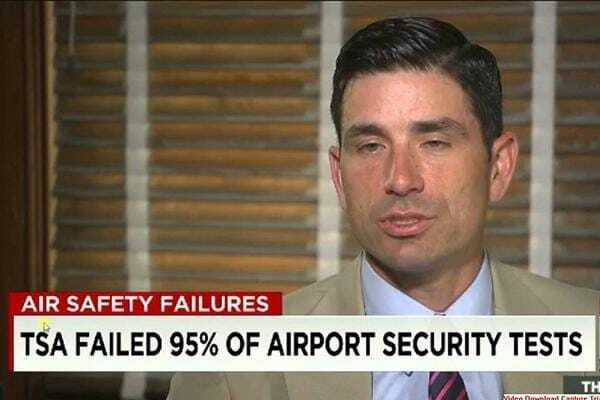 After some check-ups at select airports, the TSA did not do so well it’s safe to say! Can you believe that they missed most of the hidden contraband? Who knows what could have been brought in. 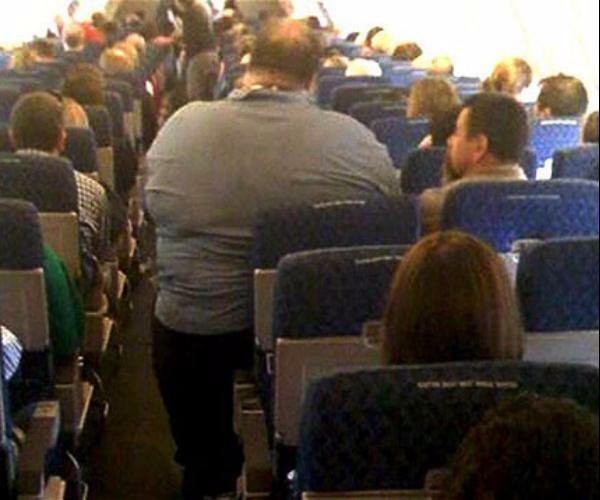 We think it is safe to say that this is a HUGE airport fail for the TSA and this gentleman has a lot to answer for. Eva Longoria always looks the part, she even sways her hair with sass during security checks. Looking good girl in all black on black on black. This desperate housewife doesn’t look desperately happy to be in security checks with non-celebs. 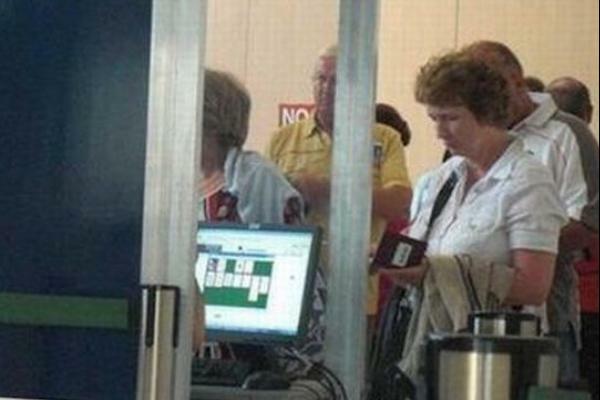 No wonder customs lines are always so long, this customs agent was caught red-handed playing solitaire. We wonder what else they look at on those screens. These poor travelers just want to get to their bags on time and the workers are taking advantage of them. It is stressful enough having to line up like animals, and not be on your phone and to take off your sunglasses and be in an orderly fashion, and this customs manager is happily playing away on his computer game. This lady is having a fun time with the flag. It is always nice to arrive at the airport to the friendly staff, sometimes when they have woken up on the wrong side of the bed. This lovely lady at Thai Airways is going to wave her customers off with a smile. 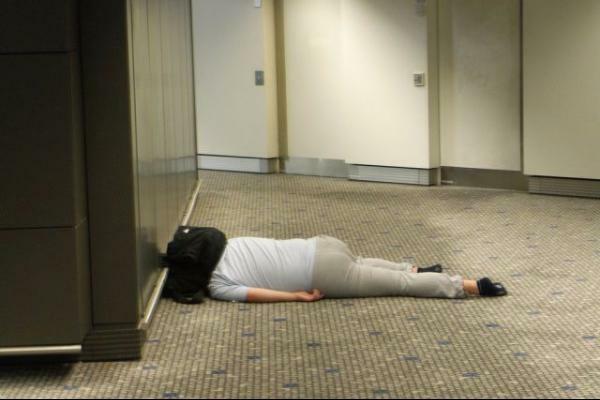 When exhaustion gets the better of you at an airport, you have to think smart and use your surroundings. This guy improvised very well we think. 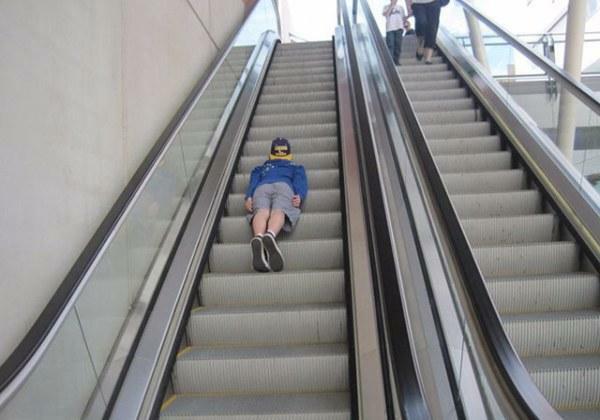 The only thing we worry about, is if he moves slightly, then the bag will move and then he will fall to the ground. 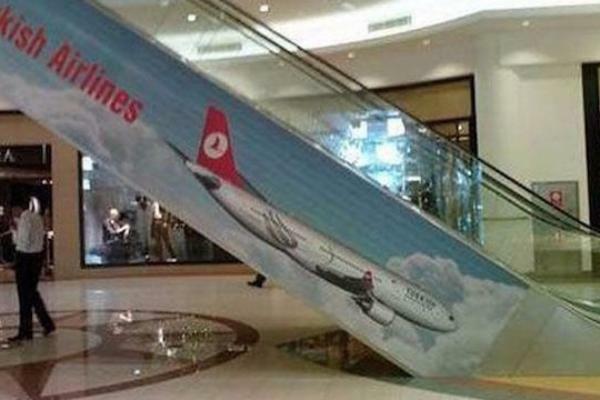 That will then most definitely be an airport fail! Durians are an Asian fruit that is known to be extremely smelly and sticky. 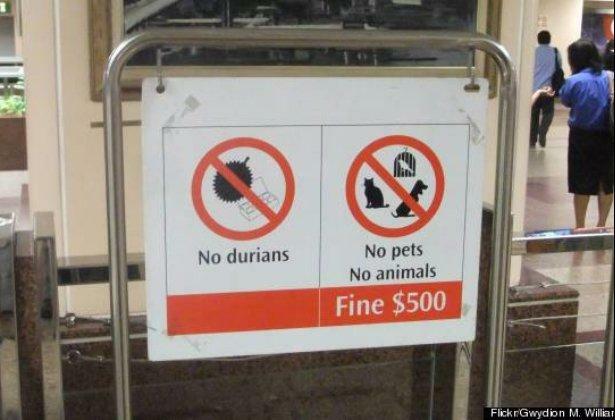 This hilarious sign is telling travelers straight! Imagine flying with lots of stinky fruit, that would be the worst. It’s bad enough getting on a flight with airplane food, or crying babies, or an aisle seat next to a huge person that is practically sat on you, but then stinky fruit? Now, that’s just a no-no. When you get bored you need to think outside the box, or shall we say on the box. This guy looks like he’s having a whale of a time, we want to try that. Imagine just whizzing away round the carousel it would feel like a Disney ride. We wonder if he fell off straight after this picture was taken. Hmmm, we want to say don’t try this trick, just in case. This is the cutest co-pilot we have ever seen. 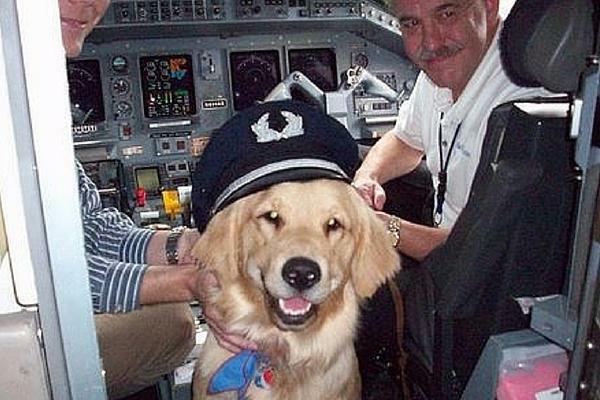 We wish all planes had dogs as mascots. Dogs are a man’s best friend. If dogs were always allowed on planes they would be so much more enjoyable that’s for sure. This dog really knows how it’s done, rocking its captain’s hat and hanging out in the captain area. This is the time when having a loved one is great, the song ‘everybody needs a bosom for a pillow’ clearly knew what it was talking about. Who got the better end of the bargain do you think here? We can’t quite tell which is the most comfortable position of the two. Sometimes boyfriends have it hard don’t they, giving up everything just to please the one they love, and this situation is no different. 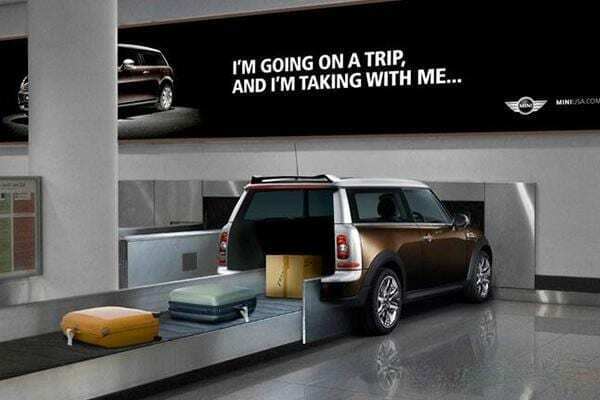 This is a genius advertising technique by mini cooper! 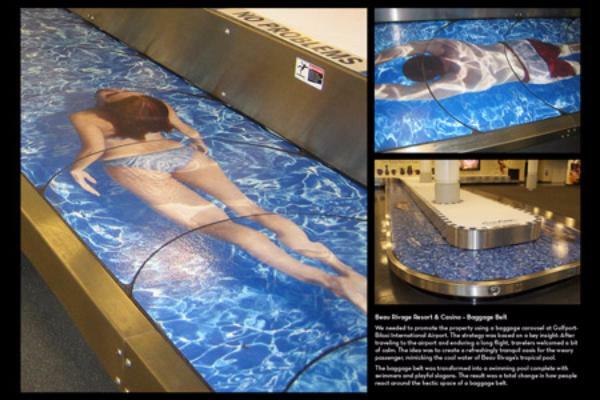 It also makes waiting for your bag so much more interesting and makes you want to go on another exciting trip. There is nothing quite like packing your bags and going on a spontaneous road trip, and this advertisement makes us want to do just that. While waiting for your bags to arrive, it’s a nice way to daydream of your next adventure. This was an advertisement for BMW in the Hamburg airport in Germany. It’s genius. 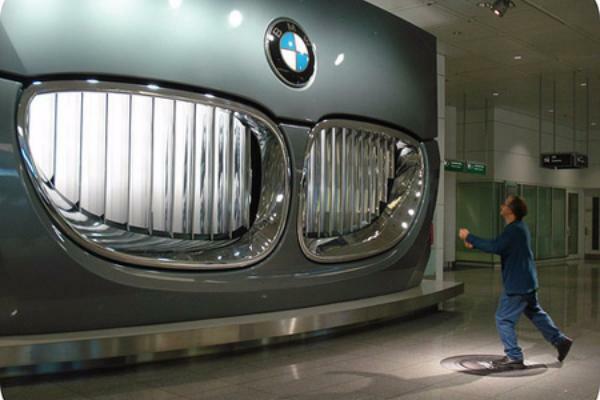 Imagine just strolling through the airport ready for your flight and being bombarded by a huge BMW grill. It certainly makes us want to buy a shiny new car. We wonder how many people stopped to look and touch this huge sign, it’s very alluring. When you are a jet-setting couple, you need to outfit co-ordinate. Kim and Kanye always do this well, but they never look like happy travelers. Black on black on black seems to be the basis for all of their outfits, with an embellishment here and there. Kanye is known for being quite the moody celebrity when it comes to being papped. We can only imagine what happened to the person on the other end of this camera. This probably wasn’t the best way to try and park a plane in icy conditions. 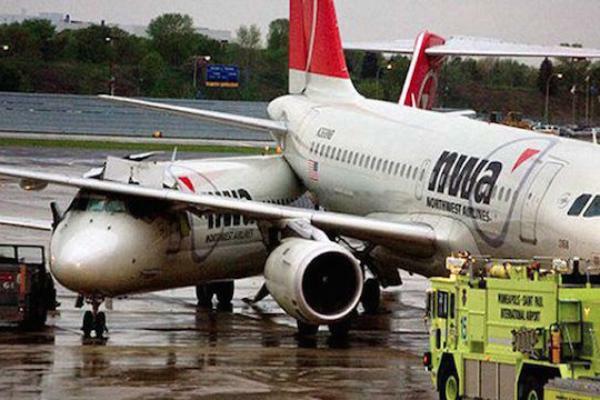 This is not exactly the outcome you would want if you were about to board this plane. 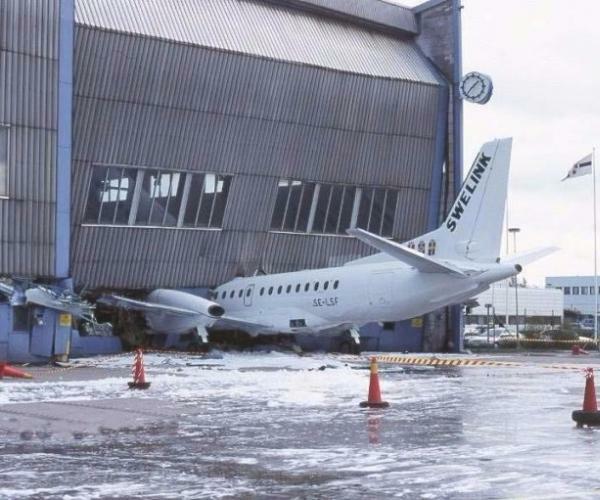 Let’s just hope that no-one got hurt, especially the captain, hopefully, there wasn’t anyone on the plane at the time. Icy conditions are scary for any type of transport. Have you ever been in a car on black iced roads? Frightening. Excuse me miss, but we think you forgot your baby. This little baby looks so happy and very occupied with the contents of the tray. We understand security is a stressful time, having to unload all your belongings, your belts, and laptops, liquids, and gels, electrical items, babies…..
How far do you think the baby got before someone noticed? When the going gets tough and desperate times call for desperate measures. You have to make the best out of what you have, even if it is a wooden chair. She does not look comfortable. 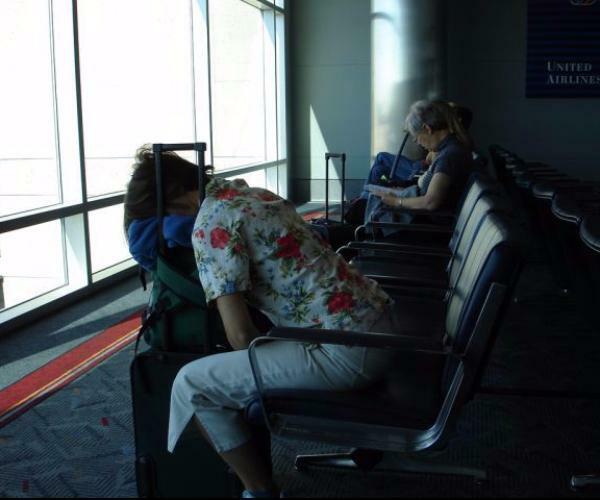 Nevertheless, when you’re exhausted at an airport you will take anything just to catch some ZZZZs. Well, this guy was found when the baggage handler couldn’t pick up the bag. He must be very flexible to fit in such a space. He doesn’t look too happy he must have been in there a long time all squashed up. Was it a prank or do you think he knew he would get found out at some point? The carrier looks disappointed that her trick didn’t go to plan. She should have practiced before we think. 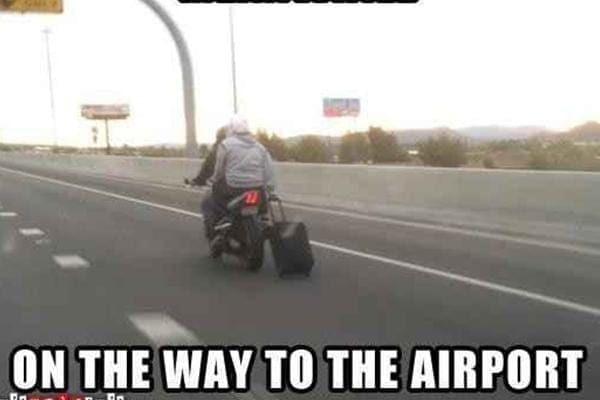 Well, he knows how to travel in style. Do you think this was one of those situations where he picked up the wrong suitcase and was forced to wear someone else’s clothes to the airport to go and declare his bag lost? Or do you think he was on his way to NYC fashion week? 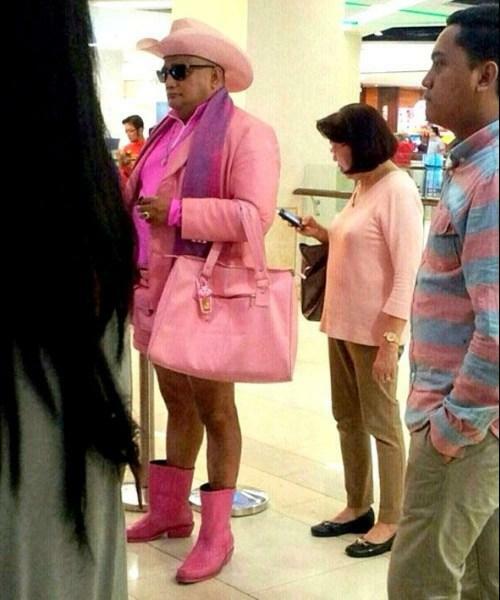 Whatever the reason, he is rocking pink perfectly. Look at those boots, they really enhance the calves. The other travelers don’t seem phased by his garish outfit at all. Why? We have no idea, but very glad they did it. They look very strong, could this be some sort of group bonding session or a new workout that everyone needs to try. Pulling a plane technique, it could catch on, you just never know. 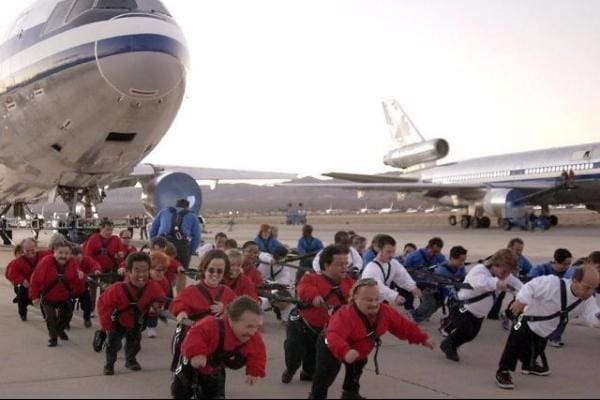 We are not too sure if they were successful in actually moving the plane, however it is a very cool photo and they look like they are having a lot of fun. Even Acadamy Award winning actresses get searched when going through security. Jennifer Hudson, you look good girl! She’s J Hud so she obviously isn’t hiding anything under there, but they have to take all necessary precautions. We bet the security is loving this situation right, huh? 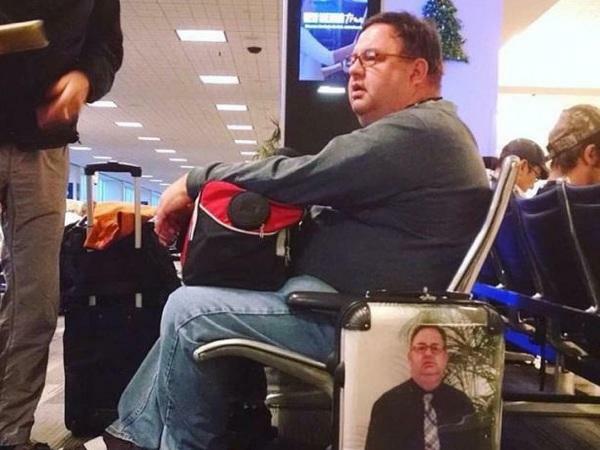 These are some very innovative suitcase covers. This has made us really want sushi what about you? Nothing says seafood lovers like a sushi suitcase. Imagine waiting for your bags and seeing these. We can take one or two guesses at what part of the world this airport is in. Can you? We want to invest in one of these babies to snazz up our suitcases now and be the center of some interested looks when they come off the carousel. 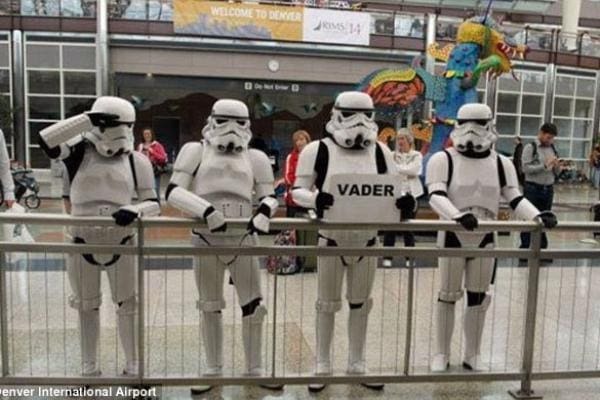 These stormtroopers lined up outside the Denver International Airport before the premiere of the newest Star Wars. 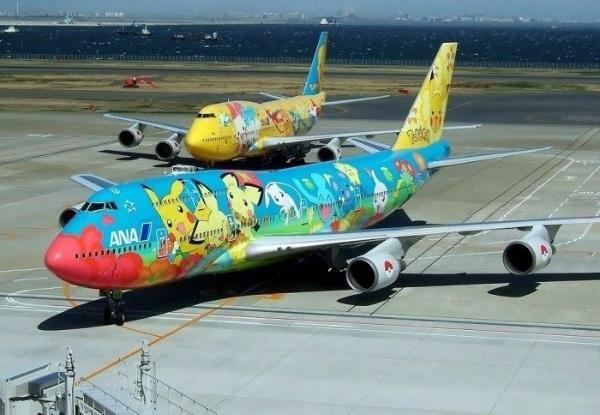 These Pokemon themed planes are amazing. They were launched as part of a promotion for the release of Pokemon Go. This is a great way to drive up to the airport. 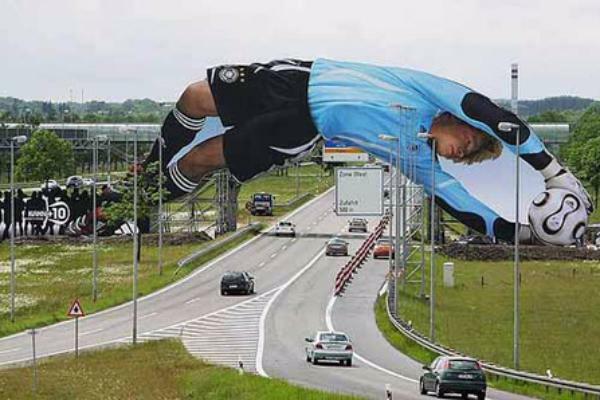 If you’re a soccer fan, you will love this! He dives and he gets that ball. A brilliant advertising technique that will definitely have caught the eye of many drivers on their way to begin their jolly holidays. 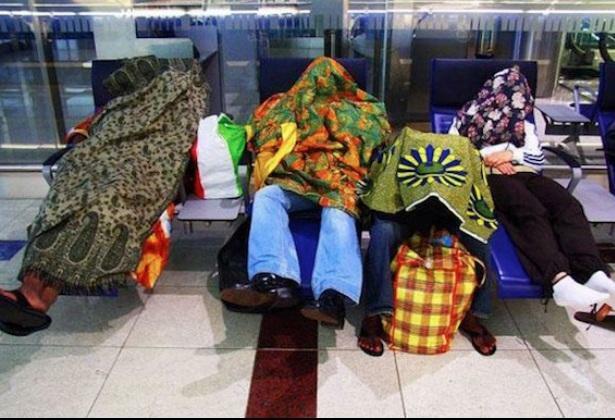 Sleeping in airports is the worst, especially when you’re cold and there’s too much light. But this guy knew what was up and solved the problem brilliantly! He was very innovative in this moment, so simple yet so effective, and if he gets bored he has something to read also. He looks very comfortable don’t you think? Now, this is a clever advertising technique. It sometimes is like roulette whether or not you will get your bag after a flight. 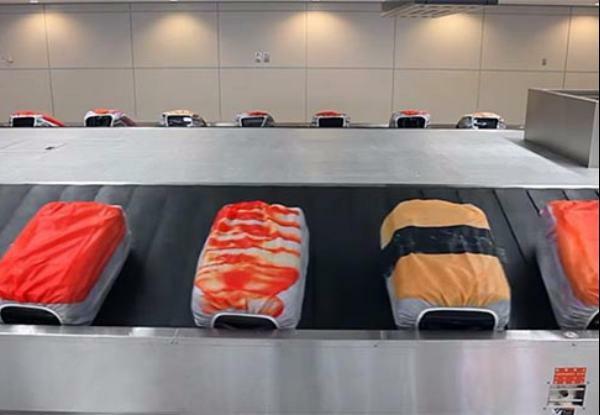 This will keep travelers on their toes while waiting for their bags to arrive and even watching other travelers to see what will happen to their bags. We would be very entertained waiting here for our bags. This is very comical and genius roulled into one. Ummm we don’t think that was supposed to happen! Delta is known as that airline that very often, flights are delayed, bags get lost, things tend to go wrong let’s just say. 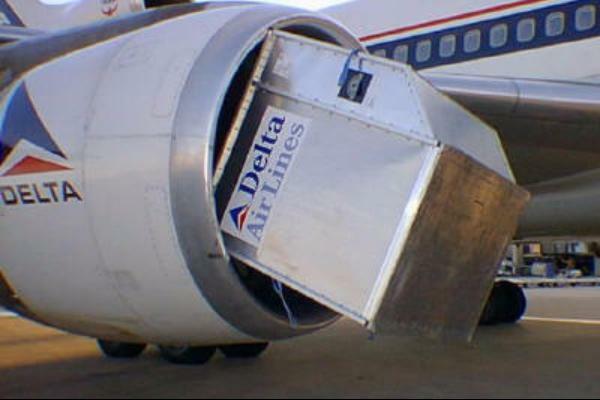 Well, they aren’t proving anyone wrong in this situation, with this baggage holder right up in the grill. This would not be a very good start to a flight and we wonder how long many angry passengers had to wait before this problem was solved. 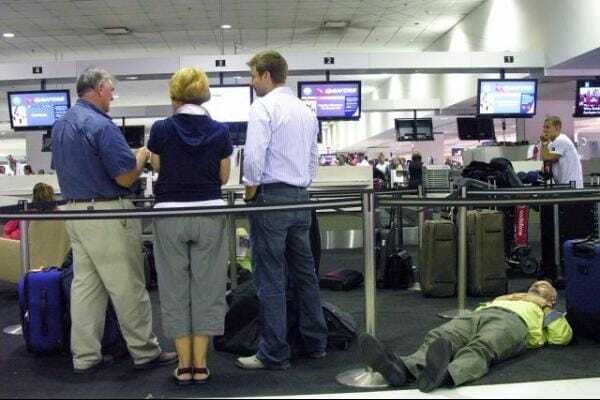 Apparently, the lines at this airport are so long, people have enough time to nap before they get to the counter. It can take such a long time to check in at an airport, the staff has to ask all the security questions, some people have a few bags, some travelers waste everyone’s time taking things out of their bags to make it lighter so they don’t have to pay for overweight luggage. You just don’t know how long it could take, so getting a quick nap in is very clever we think. Gaga takes travel fashion up a notch! We wonder if she takes off her shoes during the flight. It is never a dull day in the life of Gaga and her closet. She has nailed the towering heels to a T.
Remember when she showed up to the awards show as a slab of meat? Or the time she had a teapot on her head? Gaga, we think you are great, keep the outfits coming we can’t wait to see what you come up with next. When you pay for extra leg room and get a giant instead. There is nothing worse than a long haul flight without any room and the person sat next to you is actually sat on top of you so you can’t find the armrest or even get out to go to the bathroom. Middle seats are always the worst. Some of these dogs actually think they're humans.